Cooling tensions with China aren't enough to save investors on Tuesday. The Dow Jones Industrial Average fell back into correction territory after losing 345 points Tuesday. The Dow was up nearly 245 points at its high point Tuesday. The Nasdaq led the way lower, falling nearly 3%, or 212 points, on the day. The Dow is on pace for its worst month of trading since January 2016. Stocks wavered on Tuesday, March 27, following one of the strongest rallies on Wall Street in nearly three years as investors swooped in to snap up cheap equities amid a cooling of tensions in the U.S.-China trade war. Stocks weren't able to maintain their early momentum and sold off heavily into the closing bell with the Dow Jones Industrial Average falling back into correction territory one session after it had its best day in years. The Dow Jones Industrial Average fell 1.43%, or 345 points, to 23,858, while the S&P 500 declined 1.73%, or 46 points, to 2,613. The Nasdaq dropped 2.9%, or 212 points to 7,009. Leading the decline on the Dow were Microsoft Corp. (MSFT - Get Report) which fell 4.6% to $89.47, Cisco Systems Inc. (CSCO - Get Report) , which dropped 3.13% to $42.68, Goldman Sachs Group Inc. (GS - Get Report) , which declined 3% to $247.26, and Visa Inc. (V - Get Report) which declined 2.7% to $117.40. Stocks posted strong gains on Monday, March 26, following reports that the White House was ready to open dialogue with China in an effort to avert a global trade war. The Dow jumped 669 points, or 2.84%, to 24,202, the S&P 500 gained 2.72% and the Nasdaq soared 3.26%. Each of the three indexes on Monday posted their biggest one-day percentage gains since August 2015. The initial rebound for U.S. stocks, which also was taking place globally, was fueled by speculation that officials from both Washington and Beijing were holding closed-door talks aimed at averting an all-out trade war between the world's two largest economies, a concern that was sparked last week by Donald Trump's decision to target up to $60 billion worth of China-made goods for new tariffs following his move to slap import levies on non-American steel and aluminum. U.S. consumer confidence declined in March to 127.7, below economists' forecasts that called for a reading of 131. Action Alerts Plus holding Facebook Inc. (FB - Get Report) courted controversy again Tuesday after CEO Mark Zuckerberg declined an invitation to face lawmakers in the U.K. and explain the link between his social media giant and Cambridge Analytica that led to a data scandal which may have affected 50 million users and swayed the 2016 U.S. presidential elections. CNN, citing unnamed sources at Facebook, reported that Zuckerberg was planning to testify before Congress, however. The Federal Trade Commission confirmed on Monday it was investigating Facebook's data privacy practices in the wake of the scandal. 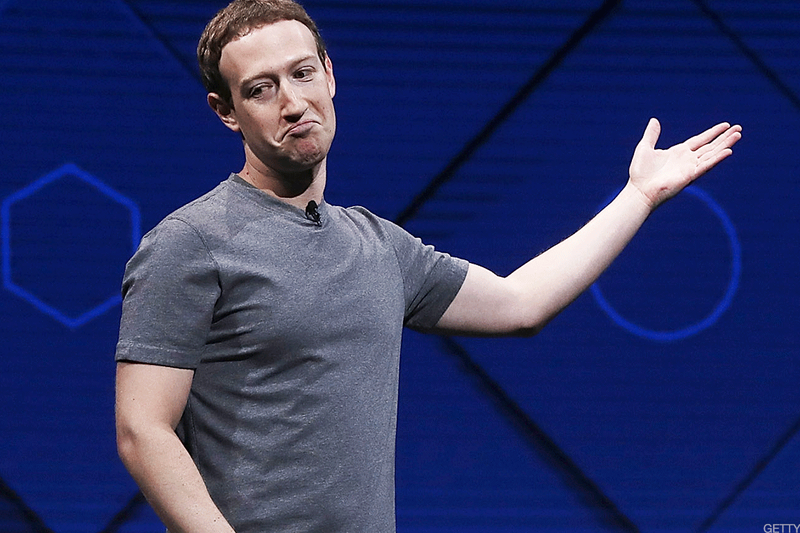 The developments - and Facebook's delayed response to it - caused the stock to plummet almost 15% last week. Shares closed down 4.9% on Tuesday. Action Alerts Plus holding Nvidia Corp. (NVDA - Get Report) fell 7.76% after reports the company would suspend self-driving tests across the globe after the Uber fatality last week. Check out TheStreet's in-depth coverage of Nvidia big product conference on Tuesday here. Deutsche Bank AG (DB - Get Report) shares rose 0.04% Tuesday following a report in London's Times newspaper that suggested Germany's biggest lender was sounding out candidates to replace embattled CEO John Cryan. However, the stock closed the day down 2.06%. The Times said Richard Gnodde, who heads Goldman Sachs Group Inc.'s (GS - Get Report) international operations, was approached by the bank, as were Standard Chartered PLC CEO Bill Winters and UniCredit SpA boss Jean-Pierre Mustier. Deutsche Bank declined to comment on the story, which quoted a source as saying the relationship between Cryan and the bank's chairman, Paul Achleitner, was "broken." Novartis AG (NVS - Get Report) said Tuesday it will exit its consumer healthcare joint venture to GlaxoSmithKline PLC (GSK - Get Report) and focus on its core pharmaceutical business. Novartis will sell its 36.5% stake to GSK for $13 billion, pending shareholder approval, in a deal set to be completed in the second quarter. Spices and seasonings maker McCormick & Co. (MKC - Get Report) posted adjusted earnings in its fiscal first quarter of $1 a share, above analysts' estimates of 90 cents. Sales in the quarter rose rose 19% to $1.24 billion, matching forecasts. The stock rose 0.3%. Shares of Red Hat Inc. (RHT - Get Report) rose 0.87% after the software company posted adjusted fourth-quarter earnings and sales that topped analysts' projections. TheStreet's Eric Jhonsa talked exclusively with Red Hat's CEO here.